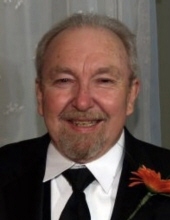 KENDALL, Larry Joseph - Age 74, of Linden, MI, passed away on Sunday, March 31, 2019 with his loving family by his side. No services will be held. However, if anyone would like to express their sympathy, they can make a donation in his name to a Veteran's organization or their local animal shelter. Larry was born on January 23, 1945 in Detroit, MI to the late Samuel and Ruth (Horstman) Kendall. He was a veteran of the U.S. Army. Larry was a former Teamster Local 299. He loved traveling on his motorcycle and also loved his cats. Larry is survived by: his daughter Annette Wilson (Marc) of Sauble Beach ON, son Joe Pollard (Kim) of Imlay City, MI, daughter Sue Sweeting (Scott) of Dryden, MI and daughter Coleen McGrath of Escanaba, MI; 8 grandchildren; and 3 great grandchildren. To send flowers or a remembrance gift to the family of Larry Joseph Kendall, please visit our Tribute Store. "Email Address" would like to share the life celebration of Larry Joseph Kendall. Click on the "link" to go to share a favorite memory or leave a condolence message for the family.